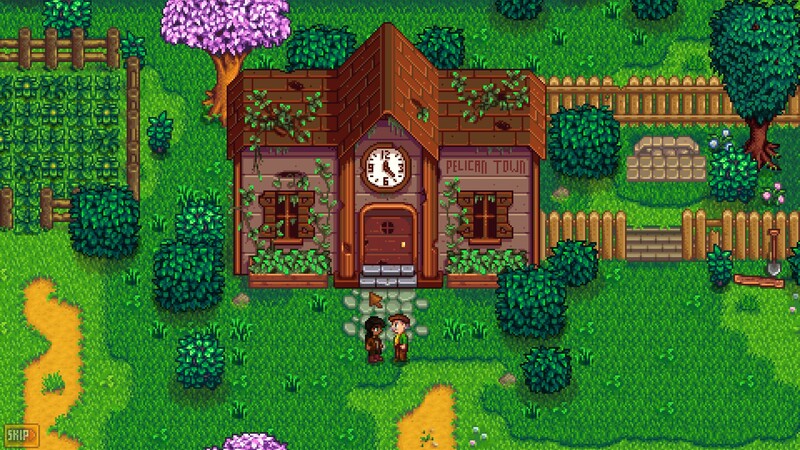 So, Stardew Valley. If you’ve never heard of it before, you haven’t been reading other gaming blogs or noticed it as a top seller on Steam. It’s a game that’s just exploded in popularity since its release. 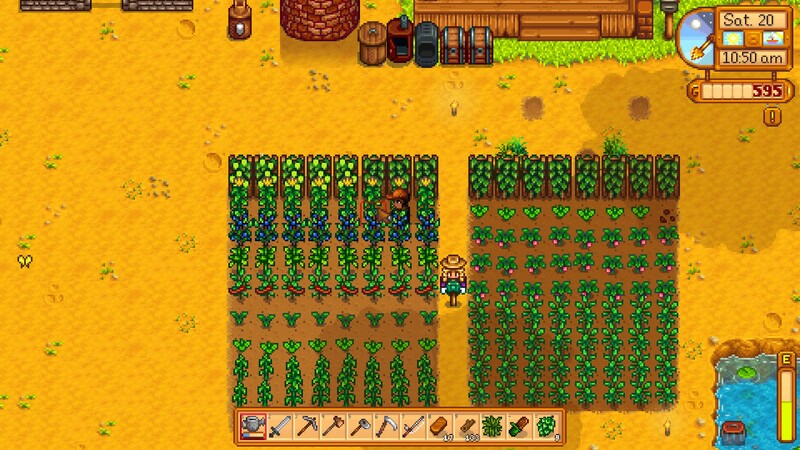 I’ve actually known about Stardew Valley for a while now…at least a year I think. I was having a sudden urge to play a Harvest Moon-like game and stumbled upon the developer’s blog while Googling. Disappointed that it wasn’t available yet but still intrigued, I kept an eye on the blog and I always loved to see updates. Ironically, I hadn’t yet noticed that it had been released until the day after when Lord Crumb saw it on Steam and bought it for me when he saw it was on my wishlist. I haven’t been able to play as much as I want yet (I’m coming up on the end of Summer Year 1) but it’s been freaking amazing. Even if my farm is more functional than pretty. Now, I haven’t played Harvest Moon since the Nintendo 64 version, but Stardew Valley is definitely better than it (even if it doesn’t have a greenhouse that stops time). There are so many aspects of the game and so many things to do that there’s just not enough time in a day to do them all. Luckily, the game is open-ended so I can move at my own pace. But I’m still always working towards some goal, whether it be completing bundles at the community center, improving my fishing, trying to earn enough money for upgrades, or attempting to delve further into the mines. I love that it’s a skill-based system and that there are specializations you can pick at level 5 and 10. I did find fishing to be rather frustrating at first (maybe it’s easier with a mouse, not so much with a controller) but after I got the Easier Fishing mod, it’s been a lot more manageable and I’m still able to unlock Steam achievements. There’s some other fun mods like pet/horse replacements (Corgis! Epona!) so you may want to check it out. 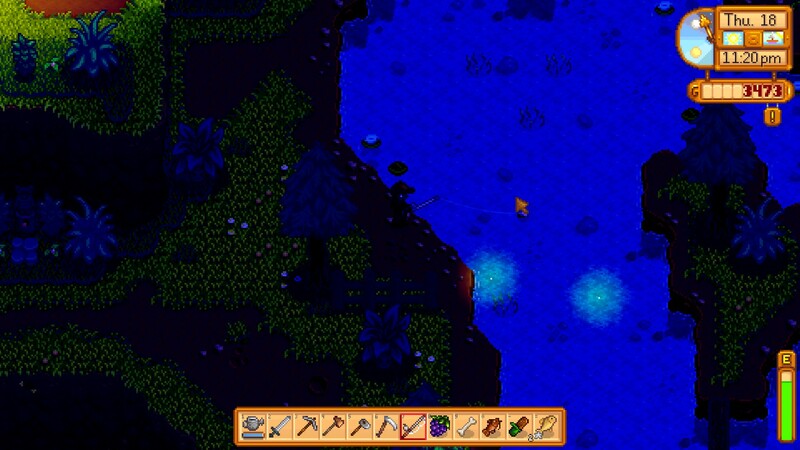 Now I don’t mind fishing at night. I’m very much looking forward to co-op being added to the game since now Lord Crumb is hooked as well. He’s never played any Harvest Moon before but after hearing me talk about Stardew, he tried it on my Steam account and has been hooked ever since. I joked that I bought him his own copy just so I’d be able to play mine. If you’re just starting out on your farm now (or even if you’ve been playing for a while), Syp at Bio Break put out a great collection of tips. I only have one addition to it: unlock the Community Center as soon as you can so you can start planning how to complete bundles. Some of them are season dependent and you might not want to wait a year to complete them.